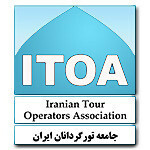 Pick up from Tabriz Airport, depend on the flight time, we can visit Tabriz Grand Bazaar and Mashrote House. 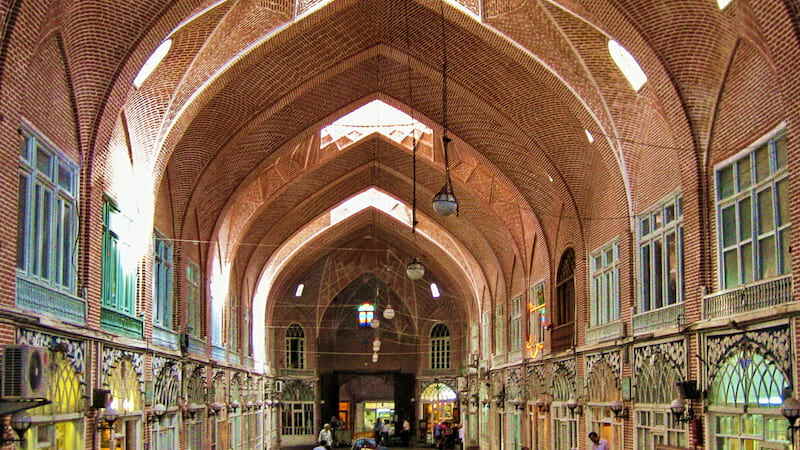 The Bazaar of Tabriz is one of the oldest bazaars of the Middle East and the largest covered bazaar in the world. It was inscribed as World Heritage Site by UNESCO in July 2010. Tabriz has been a place of cultural exchange since antiquity. Its historic bazaar complex is one of the most important commercial centers on the Silk Road. This spectacular structure consists of several sub-bazaars, such as Amir Bazaar (for gold and jewelry), Mozzafarieh (a carpet bazaar), a shoe bazaar, and many other ones for various goods. 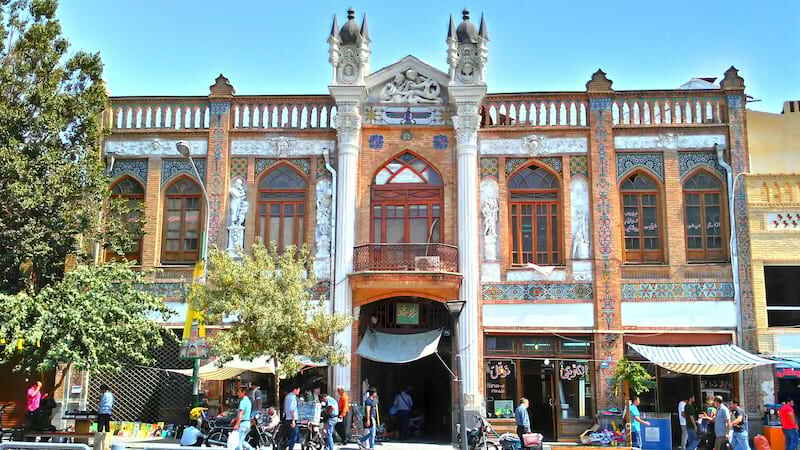 The Constitution House of Tabriz, also known as Khaneh Mashrouteh, is a historical edifice located next to the Great Bazaar of Tabriz, on Motahari Ave in Tabriz, Iran. During the years which led to the Constitutional Revolution and afterwards the house was used as a gathering place of the leaders, activists, and sympathizers of the movement. Among them, the most famous people were Sattar Khan, Bagher Khan, Seqat-ol-Eslam Tabrizi and Haji Mirza Aqa Farshi and the founder Haji Mehdi Kuzeh Kanani, himself a revolutionary activist and a well-reputed person of the time; who was named Abolmele, i.e. the father of the nation at the time. The two-story building was constructed in 1868 by Haj Vali Me’mar-e Tabrizi. It has numerous rooms and halls. The most beautiful part of the house is a skylight and corridor decorated with colorful glass and mirrors. 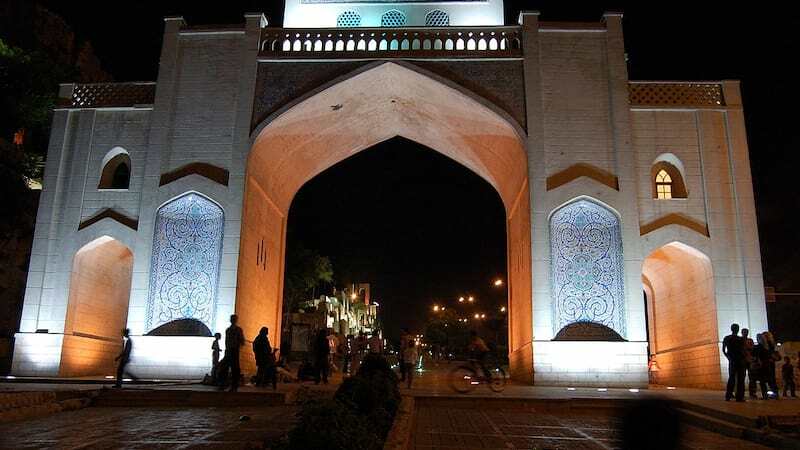 Overnight in Tabriz. In the Second day, after breakfast, we drive to Kandovan village(57km) and explore the ancient and mysterious village. Kandovan is located in a remote northwestern corner of Iran’s East Azerbaijan Province, south of the provincial capital Tabriz, lies the settlement of Kandovan. Not only is the area famous for its scenic beauty and the healing power of its spring waters, but Kandovan is also home to a remarkable modern age troglodyte (cave dweller) community. It is known all around the world for its unique rock-carved houses dating back more than 700 years. The 5 star Kandovan Tourism Cliff Hotel is the first of its kind in Iran and the second in the world, after the luxurious Yunak Evleri Cave Hotel, in Cappadocia, Turkey. Overnight in Tabriz. In this day, we drive to Soltanieh Dome(346km) and after visiting, drive to Qazvin(146km) to take some rest. 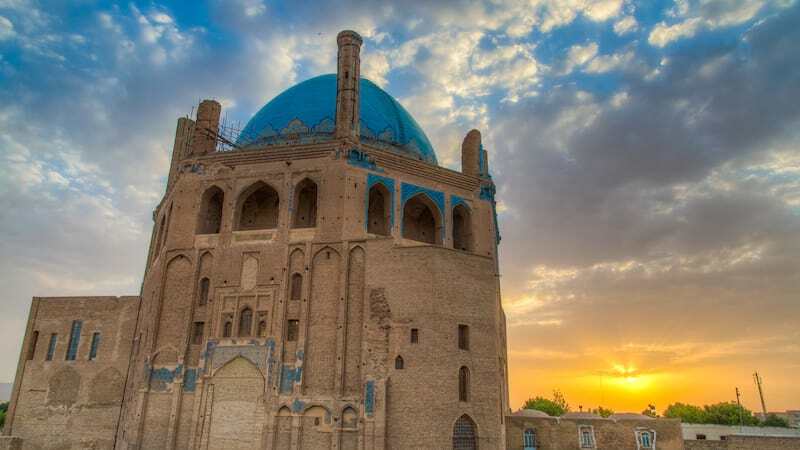 The central magnet of Soltaniyeh's several ruins is the Mausoleum of Il-khan Öljeitü also known as Muhammad Khodabandeh, traditionally known as the Dome of Soltaniyeh in Soltaniyeh city, Zanjan Province. The structure, erected from 1302 to 1312 AD, has the oldest double-shell dome in Iran. This view of the construction was made by Dieulafoy but is disputed by André Godard. In Godard's view, it is normal, if spectacularly large dome, with a thin skin on top for the faience and is in no way a double dome. Its importance in the Muslim world may be compared to that of Brunelleschi's cupola for Christian architecture. It is one of the largest brick domes in the world, just at the theoretical engineering limit for a brick dome and the third largest dome in the world after the domes of Florence Cathedral and Hagia Sophia. 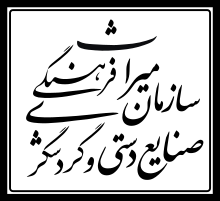 The Dome of Soltaniyeh paved the way for more daring Iranian-style cupola constructions in the Muslim world, such as the Mausoleum of Khoja Ahmed Yasavi and the Taj Mahal. Much of its exterior decoration has been lost, but the interior retains superb mosaics, faience, and murals. People have described the architecture of the building as “anticipating the Taj Mahal.” The estimated 200-ton dome stands 49 meters (161 ft) tall from its base and is currently undergoing extensive renovation. Overnight in Qazvin. We arrive in Tehran(155km) after breakfast in the hotel. We move to visit Golestan Palace and Tehran Grand Bazaar. The oldest of the historic monuments in Tehran, the Golestan Palace (Palace of Flowers) belongs to a group of royal buildings that were once enclosed within the mud-thatched walls of Tehran’s Historic Arg (citadel). 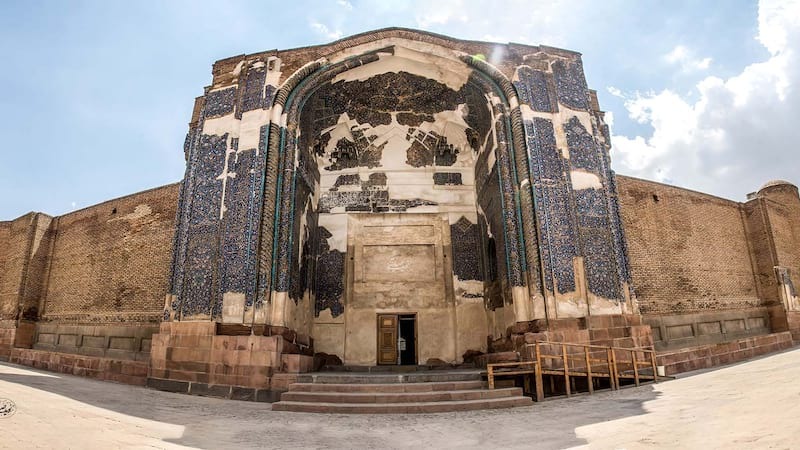 The Arg was built during the reign of Tahmasb I (r. 1524-1576) of the Safavid dynasty (1502-1736) and was later renovated by Karim Khan Zand (r. 1750-1779). Agha Mohammad Khan Qajar (1742-1797) chose Tehran as his capital. The Arg became the site of the Qajar (1794-1925). Court and Golestan Palace became the official residence of the royal family. During the Pahlavi era (1925-1979) Golestan Palace was used for formal royal receptions. The most important ceremonies to be held in the Palace during the Pahlavi era were the coronation of Reza Khan (r. 1925-1941) in Takht-e Marmar and the coronation of Mohammad Reza Pahlavi (r. 1941-deposed 1979) in the Museum Hall. 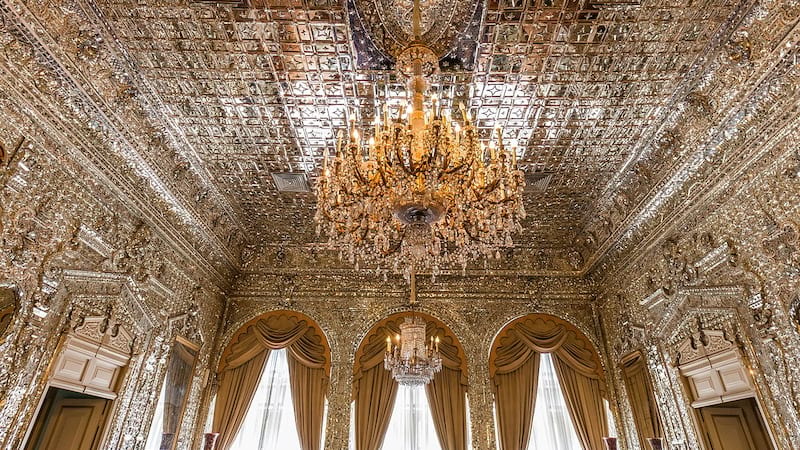 In its present state, Golestan Palace is the result of roughly 400 years of construction and renovations. The buildings at the contemporary location each have a unique history. Overnight in Tehran. In this day, we drive toward Isfahan(450km). Depend on the arriving time, we visit Naqsh-e Jahan Square. At night, we can visit Sio-se pol Bridge and Khajo Bridge. 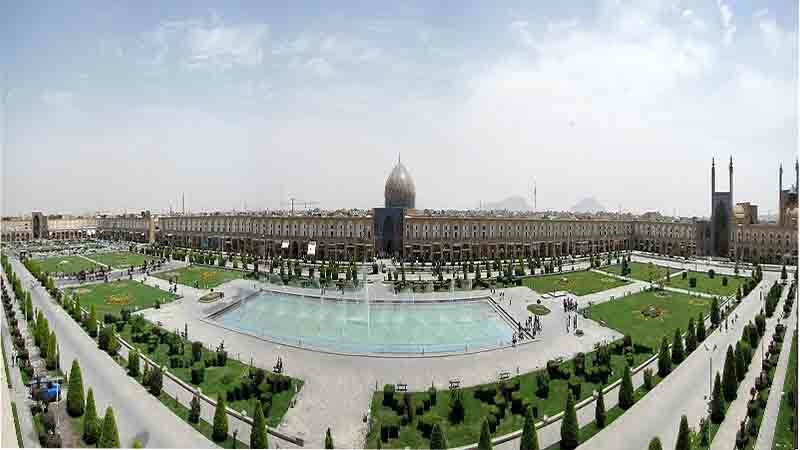 Naghsh e Jahan square, formerly known as Shah square, was the heart of Esfahan at the time of Safavids in the 17th century which was used for assembling troops, playing polo, celebrations and for public executions. Before Shah Abbas I added these monuments, an 11th-century garden existed in the vicinity of Imam square which was called Naghsh e Jahan (image of the world). The square is exceptionally significant because of its unique combination of architectural elements including arcades, floral ornaments, vast courtyard, and flowering trees. Without prejudice, it can be called the most impressive square in Iran as it is bordered by magnificent historical buildings of Safavids dynasty. 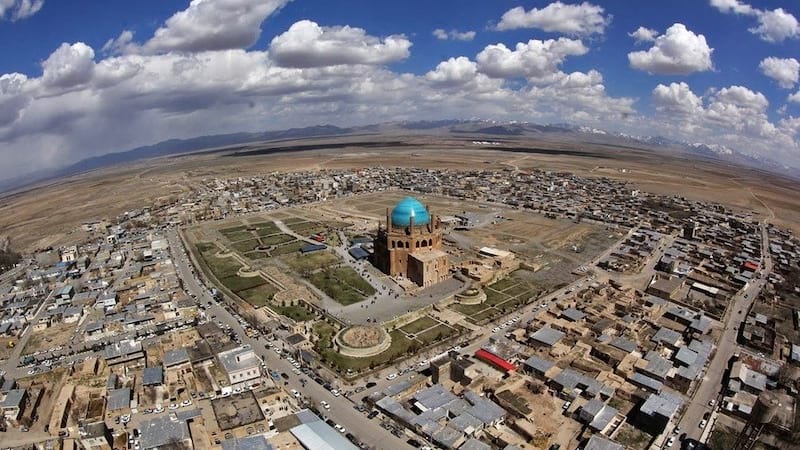 The surrounding monumental buildings are Imam Mosque to the south, Sheikh Lotfollah Mosque to the east, Palace of Ali Qapu to the west and Qeysariyeh Bazaar to the north. Naghsh e Jahan Square was enlisted as a world heritage site by UNESCO in 1979. The bridge was formerly known as Allahverdi Khan Bridge, later became popular as “Si o Seh Pol” because of its 33 arches. The bridge is built on a series of lower and upper arches of great width. On the southern end of the bridge, there is a wonderful tea house. The footpath on the top is enclosed by high walls and the roof of the arches which give you shelter from the wind and the sun while you are walking through. 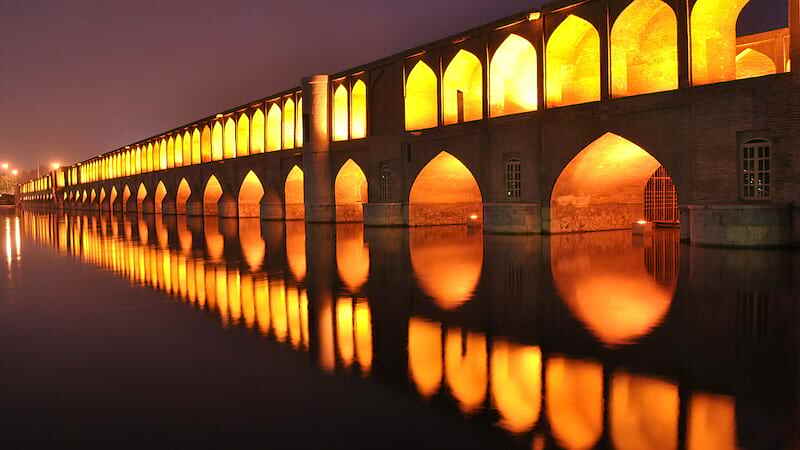 The khajo Bridge which was built around 1650 under the reign of Shah Abbas II derives its name from the district of Khajou on the northern bank. The bridge is some 110 meters long and about 20m wide and it is a replica of the older “Si o Sel Pol” Bridge with extended features. On the eastern side of the bridge, there is a basin for collecting irrigation water for the surrounding area, which is drawn off in a series of channels. On the western side, there are a series of downward steps separated by the flow of water. People used to gather to talk or perhaps to do their laundry. The spacious second story with a series of niches for people to sit is built over the 20 lower arches. In the center of the bridge, you can see an octagonal pavilion which is now used as an art gallery. Overnight in Isfahan. At this day we visit Chehel Soton Palace and Jame mosque. Chehel Sotoun palace was built in a vast garden around the 11th century in Isfahan. It is one example of palaces in Safavian era in Isfahan. This famous building has a blue hall with decorative plaster modeling and also fine and exquisite miniatures by Reza Abbasi. In your journey to Isfahan don’t miss visiting the most original Iranian paintings. 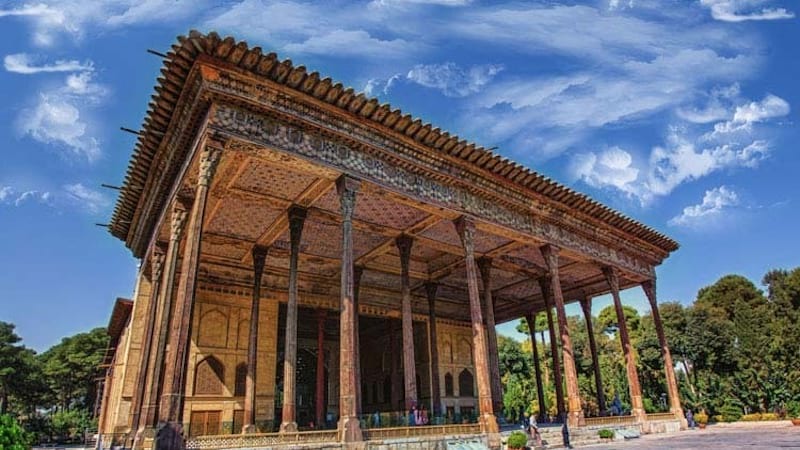 High Eiwan of Chehel Sotoun with twenty wooden columns gives the palace grandeur and special gesture. This famous building was open for public visitors in 1337 after the revolution was closed and open again in 1367 as Chehel Sotoun museum. Chehel Sotoun is an archaeology and anthropology museum. The Jāmeh Mosque of Isfahan or Jāme' Mosque of Isfahan is the grand, congregational mosque (Jāmeh) of Isfahan city. The mosque is the result of continual construction, reconstruction, additions, and renovations on the site from around 771 to the end of the 20th century. The Grand Bazaar of Isfahan can be found towards the southwest wing of the mosque. It has been a UNESCO World Heritage Site since 2012. Overnight in Isfahan. We prepare to drive Shiraz(481km), en route we visit Pasargad(356km from Isfahan). Pasargadae is registered as a UNESCO world heritage site. Historic Era Achaemenian registered as a UNESCO world heritage site. Under the name of Cyrus the Great, 599-530 BC, a Persian who founded the Achaemenid empire and ruled it from 549 to 530 BC. He formed a lasting union of the Persians and the Medes. The entire plateau fell under the sway of the Achaemenid Empire (c.550 BC-330 BC), which eventually stretched from the Mediterranean Sea to India and into Africa. After Cyrus’s death (529 BC), his body was placed in a limestone mausoleum built in imitation of a gabled wood house and set on a plinth composed of six very high steps. The Tomb of Cyrus, the impressive stone which was originally much taller but is still the best preserved of the remains of Pasargadae. At Pasargadae, you will also see the remains of three Achaemenian Palaces, known as Throne of the Mother of Solomon, Prison of Solomon and two stone plinths within a sacred area. Overnight in Shiraz. In the morning we drive to Persepolis Complex(61km). In the afternoon we visit Eram Garden. 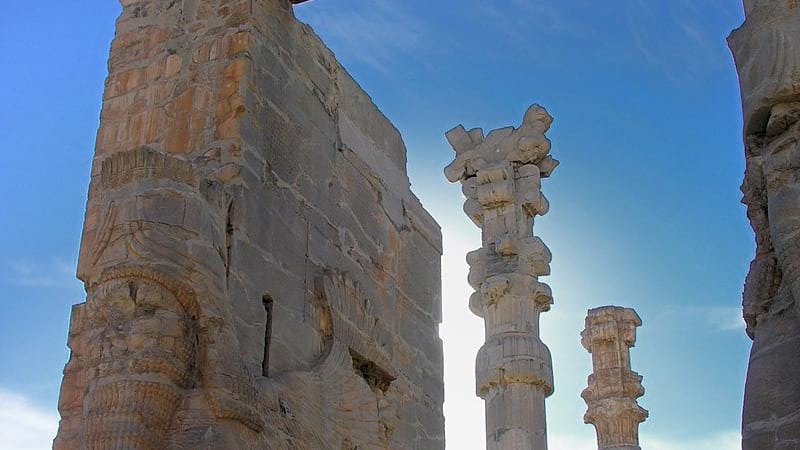 Persepolis is registered as a UNESCO world heritage site. Persepolis (Capital of Persia in Greek) or Takht-e Jamshid (The Throne of Jamshid) became summer capital of Achaemenian after Pasargadae. The construction of this impressive palace started by Darius I, one of Cyrus’s successors, in about 518 BC. Was completed over a period of 150 years by subsequent kings Xerxes I and Artaxerxes I. It was burned down during Alexander the Great occupation in 331 BC. Historian’s debate whether was accidental or intentional retaliation. The entire complex was built atop a lofty terrace reached by a double stairway that led to the monumental Gate of Xerxes. The terrace is about 1,475 Ft. long by 985 Ft. wide, and about 25-60 ft. high. To the south, across a vast open space, was the huge Apadana, or Audience Hall of Darius; east of the Audience Hall rose the massive Throne Hall—called by early archaeologists the Hall of One Hundred Columns—which was begun by Xerxes and completed by Artaxerxes. Many other structures lay to the south of these main buildings, including the palaces of Darius and Xerxes and the royal treasury. Naghsh-e-Rostam – Necropolis, Not far from Persepolis, there is a necropolis called Naghsh-e-Rostam (Rustam’s Relief: in Persian literature super-sized things are related to Rustam, an epic champion.) Here you see 4 giant tombs in a magnificent rock. 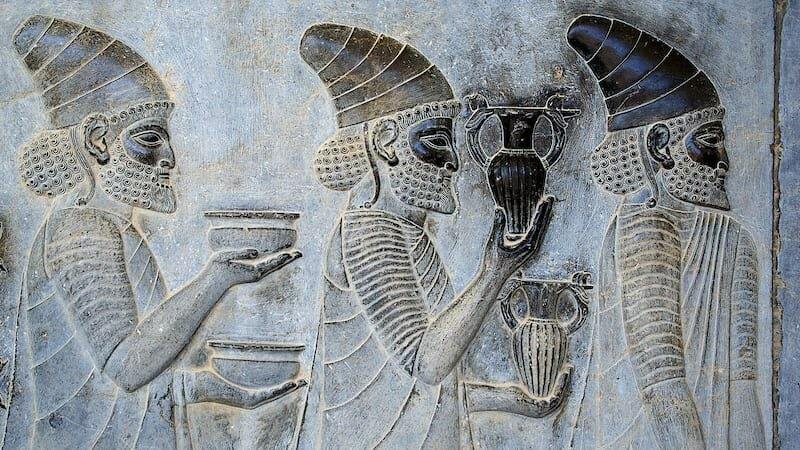 The tombs belong to Darius I, Artaxerxes I, Xerxes I, and Darius II who have been all Achaemenian kings. The tomb openings are in shape of crosses, each cross-shaped above is over 75 feet high and 60 feet wide. Eight stone carvings from Sassanian dynasty below the Achaemenian tombs showing conquests of kings; believed was created to celebrate the victory of Sassanian king, over the Romanian invader, Valerian. A 25 ft. high victory carving shows Roman leaders Valerian and Philip the Arab abase themselves before their conqueror Shaper I in 260 A.D. There used to be a ladder which visitors could climb up to the tombs but is no longer available. The size of these is incredible! There is also a building standing in front of these tombs, Ka’ be Zardusht (Kabba of Zoroaster), assumed to be a Zoroastrian fire temple from Achaemenian Period. Eram Botanical Garden, this is a botanic garden which an edifice from Qajar Era (19th century). Famous for its cypress trees it was made to compete with heaven, often called the Garden of Paradise. The edifice is not open to visitors The architect was Haj Mohammad Hassan Memar. Eram garden, one of the most beautiful gardens in the country is located in the northwest of the city and is famous for the collection of trees and variety flower especially all types of roses. The garden is most beautiful in Late Farvardin (April) and attracts lots of visitors and tourists in the spring. Besides the garden itself, you shouldn’t forget the magnificent building in the middle of the garden with unmemorable and beautiful tile paintings. Each painting depicts picture stories from Persian literature. Eram Garden is registered as a UNESCO world heritage site. Overnight in Shiraz. We drive to Yazd(448km). En route visits Abarkooh Qanat(287km). Abarkooh has 4 Adobe Ice Houses which date back to Qajar dynasty. Adobe Ice Houses (Yakhchal) are ancient buildings used to store ice and food throughout the year, commonly used prior to the invention of the refrigerator in the past. Overnight in Yazd. We have a full day city tour in Yazd, visiting the old city of Yazd, The Dowlatabad Garden, Atashkadeh (Fire Temple) and Jame Mosque. The old city of Yazd, sandwiched between two deserts, this isolated oasis town offers the visitor one of the best examples of traditional Iranian mud brick architecture and is an undoubted highlight of any visit to Iran. Yazd has always been an important commercial center on the caravan trail between Western and Eastern Iran and home to a prominent Zoroastrian community. The legacy of this rich mix is unforgettable and includes Zoroastrian “Towers of Silence”; The distinctive Wind Towers or badgirs which dominate the skyline; And some very beautiful Islamic architecture. Yazd was known as the first adobe city and second historic city in the world which the best tourism attraction, historic and cultural heritage placed in it. Yazd city in some season hosting so many tourists that sometimes there are two times more than residents. From Narin castle, the oldest adobe building in the world to world tallest windward and oldest mosque of Iran and historic residential texture are some monuments that each year attracts millions of people to this region. History of human settlement in this territory exceeded from third millennium BC. The historic texture of Yazd city is considered as Iran and human historic legacy. The Dowlatabad Garden, the residence of Karim Khan Zand, the former ruler with beautiful stained glass windows which was built in about 1750 and consists of a small pavilion set amid quiet gardens. The interior of the pavilion is superb with intricate latticework and exquisite stained-glass windows throughout. It is famous for having the highest Badgir (wind tower), 33m high (109 feet). The Dowlatabad Wind Tower (badgir), presumably the world’s tallest, is said to be 260 years old and about 33 meters high. It is surrounded by intricately hand-carved wooden lattice panels and stands atop the Dowlatabad Ab-Anbar (cistern). Water reservoirs, or ‘Ab Anbar's’ as they are nationally known, are traditional water supply systems that make urban settlements possible in the Kavir desert region of Central Iran. Ab-Anbar's consists of four elements: underground reservoir, platform, dome, and a wind tower. 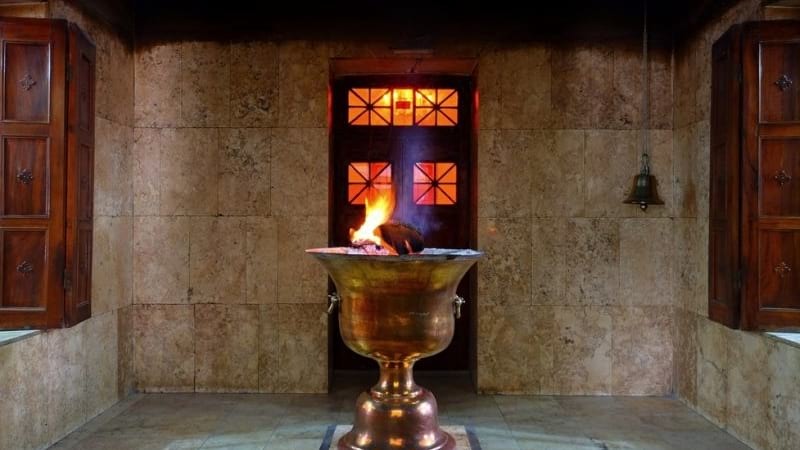 Atashkadeh (Fire Temple), the fire inside is said to have been burning since about AD 470. Visible through a window from the entrance hall, the flame was transferred to Ardakan in 1174, then to Yazd in 1474 and to its present site in 1940. Above the entrance of this building, there is the symbolic bird-man symbol of Zoroaster. One hand holds a ring, which symbolizes loyalty, while the other hand is held up to indicate respect. The wings have three layers of a feather, reflecting the Zoroastrian belief that you should think, speak and act decently. 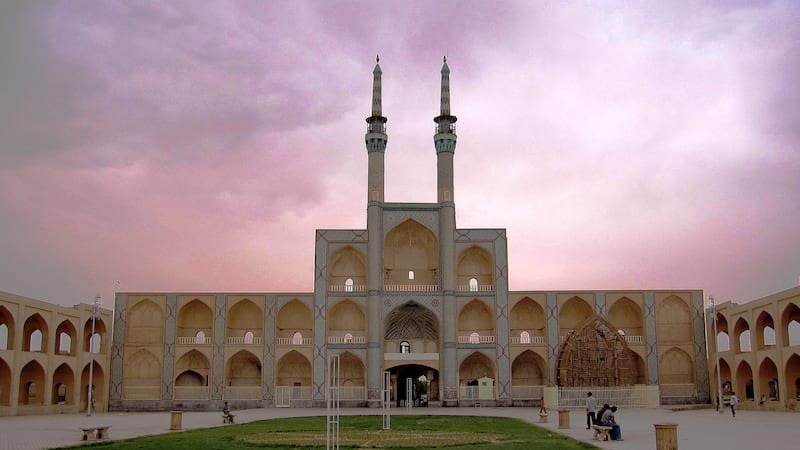 The Jame mosque is a fine specimen of the Azari style of Persian architecture. 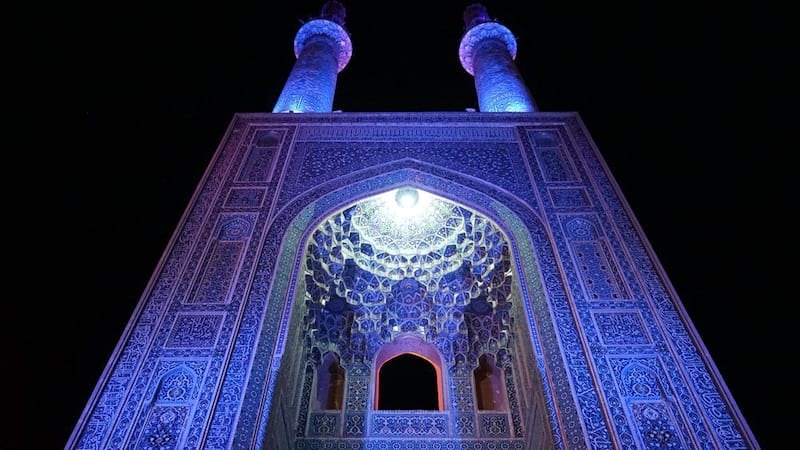 The mosque is crowned by a pair of minarets, the highest in Iran, and the portal's facade is decorated from top to bottom in dazzling tile work, predominantly blue in color. Within is a long arcaded courtyard where, behind a deep-set south-east iwan, is a sanctuary chamber (shabestan). This chamber, under a squat tiled dome, is exquisitely decorated with faience mosaic: its tall faience Mihrab, dated 1365, is one of the finest of its kind in existence. The elegant patterns of brickwork and the priceless inscription of mosaic tiles bearing angular Kufic all create a sense of beauty. The main prayer niche, the one which is located below the dome, is decorated with elegant mosaic tiles. On the two star-shaped inlaid tiles, the name of the builder and the time of construction of the prayer niche sparkle beautifully. 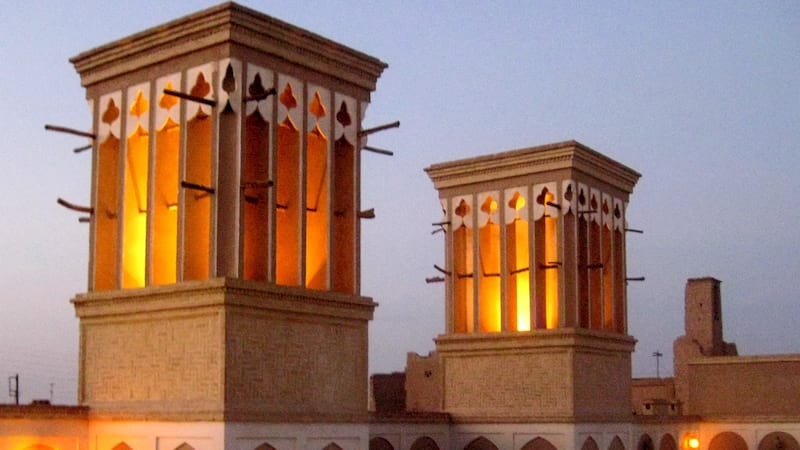 The two towering minarets dating back to the Safavid era measure 52 meters in height and 6 meters in diameter. Overnight in Yazd. In the morning we drive to Kerman(369km). En route, we visit Mehriz (45km from Yazd). Robat Zein-o-din Mehriz has been known as one of the 101 superior hotels in the year of 2009 that’s masterpieces of the architecture of Safaviyeh. Orbicular from outside and twelve findings from inside. Zeyn-Al-Deen Mehriz inn that’s the one orbicular in the country, succeeded in obtaining the award for the best repair in the year 2006 by the International Organization UNESCO. Yazd Zein-o-din Caravanserai – After 60 Km in Yazd to Kerman Road. Overnight in Kerman. We have a full day excursion in Kerman neighborhood, such as Mahan, Bam Citadel. Shahzadeh Garden is one of the nine gardens in Iran that have been registered in UNESCO. The garden`s information has been translated into thirty-five languages and placed in a tourism map of this organization. It is one of the most aesthetic looking terraced gardens of Iran that is the combination of true beauty and Iranian originality that paints a picture of the Garden of Eden with the harmony of the fountains, garden, and architecture. The buildings are utterly beautiful and the architecture is the just pure genius that distinguishes it from other Iranian gardens. The view of fountains that flow from upper ends towards lower ends caresses your eyes, these fountains don`t have a source of energy and work only with the slope of the garden. 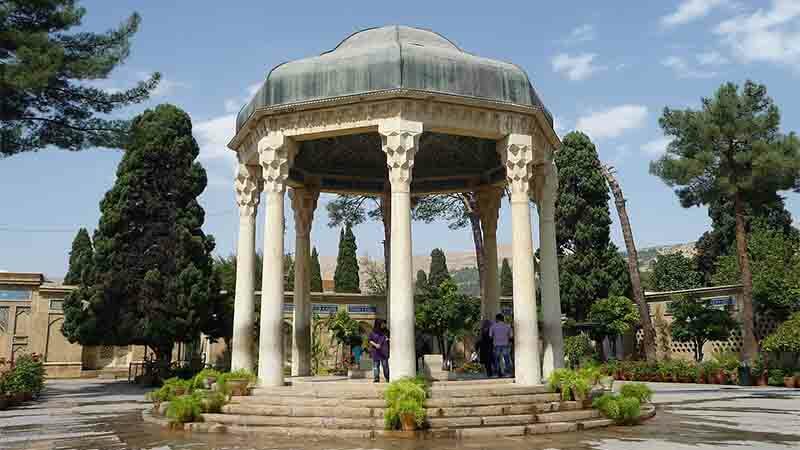 Shahzadeh garden is an example of Iranian gardens that take advantage of suitable natural conditions. This garden was built originally for Mohammad Hassankhan. Shazdeh Garden is 5.5 hectares with a rectangular shape and a wall around it. It consists of an entrance structure and gate at the lower end and a two-floor residential structure at the upper end. The distance between these two is ornamented with water fountains that are engined by the natural incline of the land. 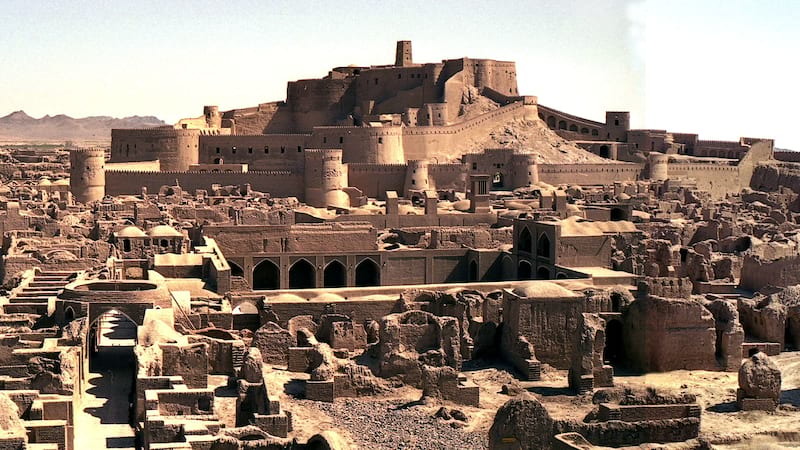 Bam Citadel is the largest adobe building in the world, located in Bam near the city of Kerman. This great historical treasure that has been registered in national heritages of Unesco dates back to two thousand years ago, It was built in the fifth century (BC) and was still used until 1850 AD. Bam Citadel that used to be in the path of Silk-road is one of the tourist attractions of Kerman. This marvelous piece of art is surrounded by a big system of ancient buildings, it is six square kilometers and placed on the top of a hill with the height of sixty-one meters, it includes the old city and the castle which was near six acres, there are gardens, houses, and farmlands at the three sides of the castle and from north it faced the lake. The building is a great stronghold and Citadel is placed at the heart of it, but due to the stunning appearance of this fortress, the whole establishment is called Bam Citadel. Overnight in Kerman. In this day, we fly back to Tehran. 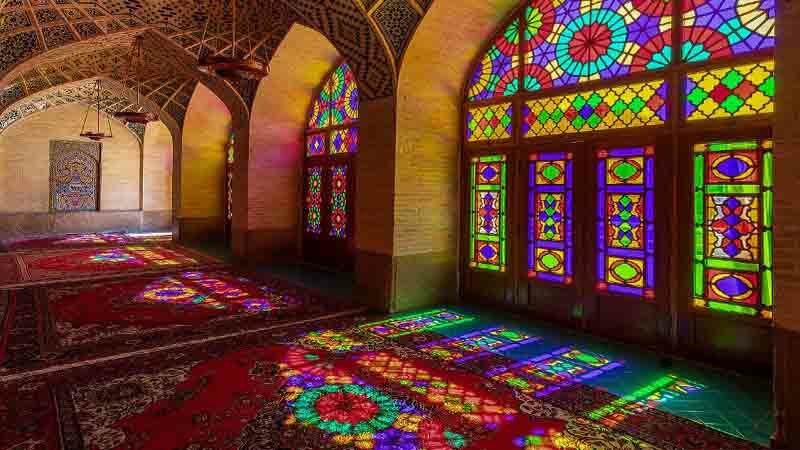 Depend on the flight time, you can explore the city and visiting amazing museums in Tehran, such as Carpet museum, Jewelry museum, Conceptual Art museum, etc. Overnight in Tehran. The last day, After 14 days exploring Iran, It's time to say bye. But we hope to see you in Iran soon.